Liv Heym, whose chamber music playing has been described as "elegant and sensual, stylishly wild" by the New Yorker, enjoys a versatile career on both the modern and the baroque violin. In march 2015 Liv was awarded three special prizes at the 8. International Telemann Competition in Magdeburg, amongst which the audience award. She performs regularly with Early Music ensembles throughout Europe such as Les Arts Florissants, Les Passions Orchestre Baroque de Montauban, the Irish Baroque Orchestra and occasionally joins ensembles in the United States and Canada, such as the Four Nations Ensemble or Pallade Musica. An avid chamber musician and collaborator, she seeks the interaction with fellow musicians and other artists in small ensembles and interdisciplinary projects. Her interests have led her to work with composers, dancers and audiovisual artists. During the season 2012/13 she created the interdisciplinary concert series "Music in Dialogue" at WMP Concert Hall, New York. Other recent projects include a staged version of H.I.F. Biber's Passacaglia for solo violin choreographed by Michele Wiles with BalletNext in 2014, performances of the Goldberg Variations for String Trio on period instruments at the Berlin Philharmonic Lunch Concert series amongst other venues, as well as first appearances in the Duo formation "Senza Basso" with violinist Beth Wenstrom. 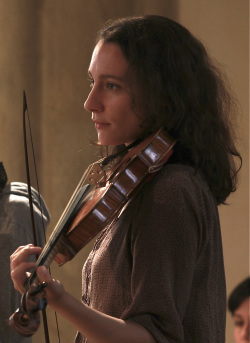 Liv was a member of the European Union Baroque Orchestra 2011 and joined the Orchestra of the Age of Enlightenment Apprenticeship Scheme in 2012 working under the direction of Simon Rattle, Laurence Cummings and Roger Norrington. She has recorded with Boston Early Music Festival Orchestra, Les Passions Orchestre Baroque de Montauban, Trinity Wall Street Orchestra and the European Union Baroque Orchestra amongst others. A native of Berlin, Germany, Liv studied Violin and Chamber Music with Heinz Dinter, Ulrike-Anima Mathé and Daniel Phillips. Chamber Music lessons and Masterclasses with Eberhard Feltz were an essential formative influence during her studies. She received further important impulses during Masterclasses with András Schiff and András Keller. Liv holds degrees in music education and performance on modern violin from the Hochschule für Musik Detmold and a Master in Historical Performance from the Juilliard School as a student of Monica Huggett and Cynthia Roberts.